The Business Climate Index for the first quarter of this year dropped seven points against last quarter’s score to 78. However, the sentiment of European and European-linked companies in Viet Nam when it comes to conditions for business in the Vietnamese market is moderately positive. These details were released on Monday in the European Chamber of Commerce in Viet Nam’s (EuroCham) Business Climate Index (BCI) for Quarter 1 – 2017. According to responses to the latest BCI survey, 67 per cent of the respondents described their current business situation as “excellent” and “good,” an approximately 5 per cent drop from the previous quarter. A slight rise was verified in the “not good” and “very poor” answers (which previously had almost no bearing), with 9 per cent and 3 per cent, respectively (from 3 per cent and 2 per cent in the last quarter). When it comes to the future, a positive sentiment regarding next quarter’s business outlook continues. Positive answers have decreased only slightly (9 per cent for those expecting an “excellent” and 60 per cent for the more moderately optimistic). While the “neutral” attitude is kept at the same level this quarter, the “not good” outlook has jumped from zero per cent to 7 per cent and the “very poor” opinions climbed from 2 per cent to 4 per cent. EuroCham members that expressed confidence in a stable and continuously improving macroeconomic scenario for Viet Nam dropped by some 10 per cent. Conversely, businesses that believe the macroeconomic conjuncture can deteriorate have risen 11 per cent to 18 per cent, at present. The number of respondents that expect no change in the next quarter remains close to the 40 per cent mark. Inflation proved to not be a major concern for EuroCham members as yet. Some 77 per cent believe inflation will have either “no impact” (17 per cent) or just a “minor impact” (60 per cent, the majority of the respondents). While close to a quarter of the respondents believe it may have “significant impact” (23 per cent, slight increase from Q4 2016), fears that inflation may threaten EuroCham members’ business as such are hereby dispelled with a resounding absence of answers in this direction (zero per cent). The sentiment of European and European-linked companies in Viet Nam when it comes to conditions for business in the Vietnamese market is moderately positive. With regards to headcount, the number of businesses expecting to maintain their current workforce size remains at some 40 per cent. On the other hand, while there is only a two per cent drop in the case of respondents stating that they would hire significantly, companies who plan to do so moderately have dropped 6 per cent since the last quarter. Responses indicating a lower headcount rose slightly — “reduce a little bit” moved from 7 per cent to 10 per cent and “reduce significantly” went from zero per cent to 1 per cent. EuroCham members that intend to maintain their level of investment in the country represent 42 per cent of the total answers, a two per cent increase from Q4 2016. Intentions to increase investment also remain substantial, with a four per cent rise in those looking to invest significantly from last quarter and a slight drop of 6 per cent for moderate investment increases. Remaining numbers remain close to last quarter’s results. 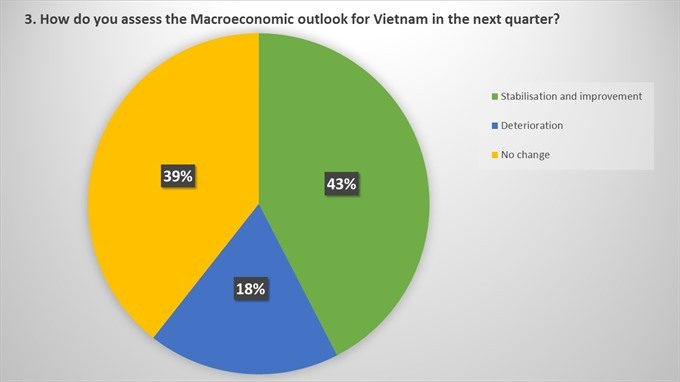 “The BCI survey results for Q1 2017 continue to show positive expectations from EuroCham members towards Viet Nam, but not at the same levels of optimism as last year,” EuroCham chairman Jens Ruebbert said, adding that this does not mean that businesses are not alert or will not continue to explore a high-potential economy such as Viet Nam, as evident from the results of the survey, according to which 90 per cent are either maintaining or increasing investments in the country.